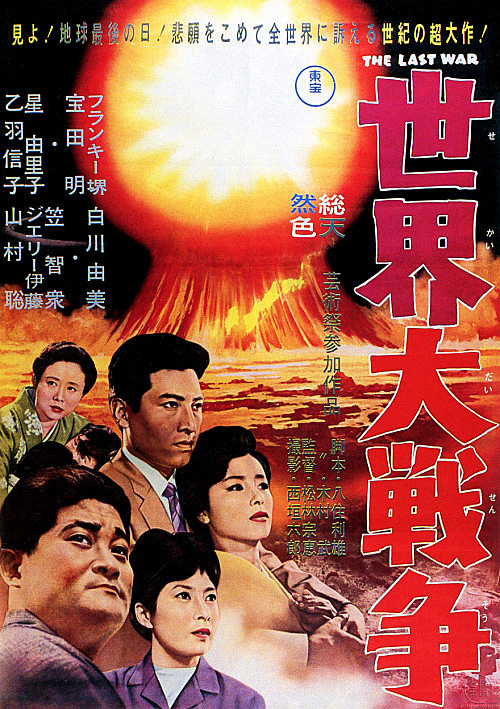 In 1961, Toho Studios put out a blatantly preachy anti-nuke film entitled Sekai daisensô. It was basically their version of On the Beach minus any subtlety or allegory. Their goal was to use all their technical skill to present a film as realistic as possible in describing what would happen to Japan in the event of a worldwide, nuclear holocaust. 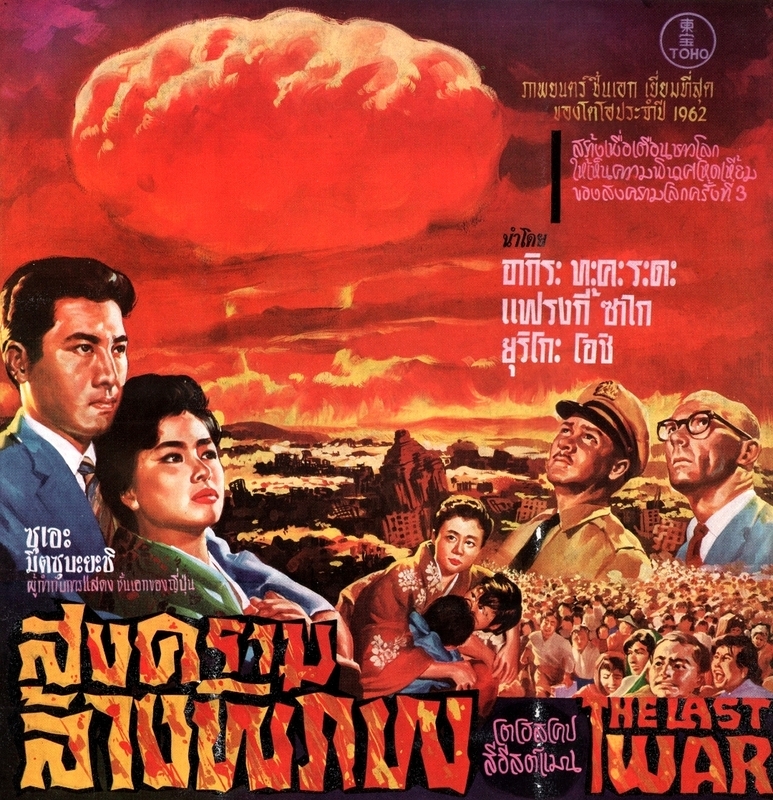 The film was later dubbed into English and released as The Last War. Similar to On the Beach, sailors aboard a merchant vessel express their wish to return to Tokyo, even though they'll eventually die of radiation poisoning. Told in flashbacks, the tale of a Japanese family is set against the backdrop of worsening international tensions between the two superpower alliances which dominate the world. Eventually, air patrols from both sides fire upon one another over the Arctic using air-to-air nuclear missiles (to take out three planes at a time?!?). The unidentified, but obviously communist, bloc's tanks crosses the 38th Parallel in Korea, but are soon stopped. So, they decide the best way to deal with incompetence is to set off nuclear missiles, some of which head for Japan. There's panic in the streets, as millions flee (which, of course, people in Japan do well, having run away from Godzilla, Mothra, Gorgo, Kong, Rodan and God-knows-how-many-other monsters, which always seem to attack Japan whenever they wake up from a deep sleep). Since Ronald Reagan wasn't politically important enough at the time to suggest a Star Wars' anti-missile defense system, there's nothing left to do but wait at home for Armageddon. It doesn't take long: Tokyo is extinguished in a blast and subsequent fire storm. Models of Washington, London, Paris and Moscow are wiped off the face of the Earth, too. Typical of Japanese sci-fi films of the time are the model landscapes and cities which are destroyed, as well as the tanks and planes which fire missiles unrealistically. The only thing missing is Godzilla and maybe a few, tiny Japanese ladies to sing a song to put the monster (and the Russians?) back to sleep. Thus, one doesn't experience the premonition of doom one would get from watching movies like Failsafe or The Day After. 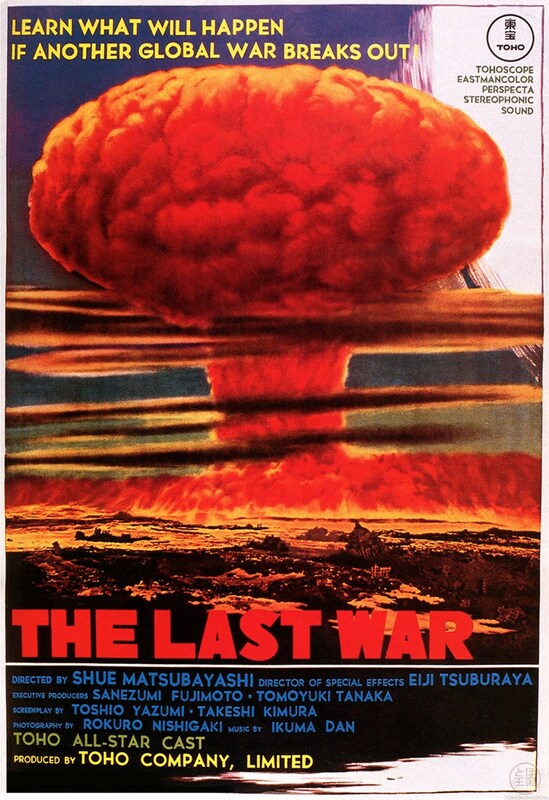 Instead, a more realistic name for this movie might be, Jerry Lewis plays with Atom Bombs (aka Nice Lady! You forgot Your Plutonium!). DVD-R is in Japanese with hard-encoded English subtitles. Approx. 108 mins. See film sample for audio and video quality!